Will 5-Tracker Stem Bundle Enable Decoupled Aiming; if yes, for what titles?! Will the Stem enable decoupled aiming in ALL PC titles or just the ones specifically made for the Stem? Also, I see that it's backwards compatible with the Hydra, but I don't see any aiming going on when I watch hydra gameplay vids on YouTube...so will they "add" to the support of these games or merely stating that you can use the Stem the same way the Hydra worked with said titles, in other words, mere tilt recognitions & degree angle BS. Stem system will allow for decoupled aiming but the game needs to be specifically made for it. The only game that i know that supports the Hydra for decoupled aiming and so would also support the stem system is the Half Life VR mod for Half Life 2. However at this point in time i am considering the Stem system to be DOA. There were too many delays its WAY to expensive and the Vive controllers are at least as good if not better. The Sixense Stem is not dead. They recently passed FCC testing and are planning to ship around April. They released the demos they have been showcasing and made them work with Razer Hydra. It actually works REALLY WELL, check it out. Well that is true but I see a few issues with the Stem system. Devs already have tracked controllers they know the owners of an HMD will have. So why add support for a third party controller that does not really do anything extra. Having the HMD and the controller's tracked separately mean that you will have drift issues between the two. Notice how all demo's they have a stem tracker on the head. That's not because there using a DK2. There is nothing wrong with the tracking system its just the fact that they are separately tracked and there is nothing to sync them up. At least not that I am aware of. With the large tracking volume of the Vive the Stem tracked area is not big enough unless you mount it to the center ceiling of the ceiling in your tracked area. Last I checked it had an stem base station had an 8 foot radius. Now if this came out a year ago it would be a different story. It would have been the only controller on the market to go with the 100K rift DK1/DK2 out there. Then devs would have started using the Stem system while they waited for the 1st party controllers. I really dont think the Stem controllers will be widely adopted. They are just too late to the party. The one really good benefit is they dont suffer from occlusion issues. So there could be some situations where that is a big win, though I can't think of any, but I dont see that being enough to sustain them. STEM has better potential I think than either Touch or Lighthouse controllers, but I completely agree that the future doesn't look all that hopeful. Sixsense are the masters of this field and they support 5 trackers, no doubt I think STEM will be an excellent product. It's just a case of how many games will be able to fully utilise it now that Touch and Lighthouse both only have 2? At very least I think STEM should be able to emulate Touch. I really dont think the STEM has much potential, the only think it really has going for it is that it does not have a line-of-site requirement. The STEM system, like the Oculus' Constellation system, is limited to the number of devices that can tracked. The STEM much more so than Consolation. This is a side effect of outside-in positional tracking. The lighthouse system on the other hand is inside-out tracking. This has some major benefits. The lighthouses are dumb. All they do is shoot lasers and blink. They dont know anything about what is being tracked. They dont need to be connected to a computer. They only need power. There is no realistic limit to how many objects can be tracked. This is because each object calculates its own position and then sends just that positional information to the PC. You can track multiple objects on multiple Computers with the same lighthouse sensors. Someone Demo'ed this at CES. Two lighthouse stations where tracking 3 Vive Pre HMD's attached to 3 separate computers. They are more secure. Since the lighthouses are dumb and they dont actually know the position of the objects there tracking, or that they are even tracking objects there is potential for public tracked areas. This allows for some very interesting possibilities in the future. I think Vive/Touch suffer from occlusion though. I think the jury is still out which approach is best. Losing tracking can be nausea inducing. Very true @blazespinnaker it is possible to occlude both the Rift and Vive controllers, however with proper camera/lighthouse placement you have to go out of your way to occlude them. Several reviews of the new Vive Pre controllers, including Norm from Tested, said they where not able to occlude them in without going out of there way to do so, such as putting them under a jacket or something. That being said I could see having a 1:1 representation of say a hand gun that you have in game in the real world that you can actually holster would be very cool. It would be very difficult to do that without something like the STEM. Considering the STEM system is as much as the HMD's themselves i just do see it really being an option unless you have some very spastic application that can not have occlusion issues. What intrigues me is that everyone talks about how awesome the Vive 15x15 room scale is, however in testing the Stem is accurate to 15 feet from the base station. This means if the base is in the middle of the room you would have 25-30 square feet to roam occlusion free. I plan on experimenting with it in my garage and seeing how far I can push it. 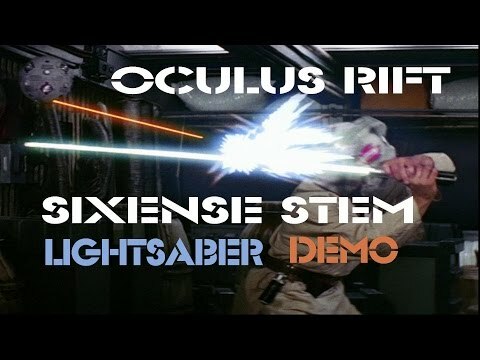 STEM (with 5 STEM packs) is superior to Lighthouse and Oculus in every way, but it looks as though Sixense does not care to deliver the product. Nope. The only thing STEM has going for it is that it does not suffer from occlusion which has been demonstrated time and again to not be an issue, and its no more, or less, accurate than the other tracking systems. On the negative side is that its ridiculously expensive. A full 5 stem pack system costs more than the Rift and all it is is a tracking system. it also has a limit to how many things it can track, i think 5 may be the limit if i recall correctly. Lighthouse on the other-hand does not have any limit to the number of things it can track. Oculus's constellation does have a limit but they have not said what the upper bound is. if i had to guess i would say around 10 or 12 objects, max, though that's just a guess. I still believe the stem is superior to vive and oculus's tracking. Some may disagree but the modular stem packs are fantastic. that allows you to take any gaming controller or object and turn it into a vr gaming device. ****...have an old light gun from your 360 lying around. Tape a stem to the front sights. BAM just like that you have a functioning gun with 1 to 1 tracking. no need for expensive 3rd party gun controllers. use w/e gun or any type of controller you want. I think this will also allow for any company to make their own stem compatible gamepads for a very very low price. On the other hand touch and vive controllers are not modular. You get two tracking points...thats it. thats not very good i think. you can always buy the bare minimum stim. IF you think oculus and vives solutions are better check out StrikerVR. I think lighthouse doesn't hold a candle to that....pun intended. that allows you to take any gaming controller or object and turn it into a vr gaming device. Whats stopping me from doing this with a Vive controller or even touch? You just need to make sure the sensors are visible. Further more Valve have said many times Lighthouse is an open standard, anyone can make peripherals for it. Not only that but the materials are inexpensive off the shelf components. There are also no hard limits on how many devices you can track with lighthouse since the calculations are done on the MCU of the device thats being tracked and not the lighthouses themselves, they are dumb. no need for expensive 3rd party gun controllers. What?? You just invalidated your entire argument. the STEM system IS an expensive 3rd party gun controller. A full stem system if only $20 less than the rift itself! IF you think oculus and vives solutions are better check out StrikerVR. I think lighthouse doesn't hold a candle to that....pun intended. First off, StrikerVR has (some time ago) re-branded themselves to http://www.haptech.co/ and very much regrettably looks like they are refocusing on military only, which is what they originally did. Secondly, I thought you didn't want to buy expensive 3rd party controllers? Whats stopping me from doing this with a Vive controller or even touch? Well a STEM pack has a big advantage of not requiring line of sight - which in the case of bulky props or small things that can be tucked away may well become a big issue. Also, the STEM pack has an actual connector to allow it to be clipped onto things securely. True, but does that single feature really out weigh all of the negatives? The whole VR system is useless without deoupled aiming in the world of FPS IMO. Maybe fun to play other games, but the whole idea behind the head tracking is that you can look around without the rest of the body and aim following... War thunder with an Oculus and Joystick is great... But I need decoupled aiming to go with my Omni as I'll largely want to be playing shooters on it.